Scientists analysed images of Ceres, a rock 946km wide (Montana is 1,014km wide) and the largest asteroid in the asteroid belt, taken by NASA’s Dawn spacecraft. They found that Ceres is covered in ice volcanoes, and estimated that a new one probably appeared every 50 million years in the rock’s history. The research demonstrates that Ceres is an important body for studying ice volcanoes in general, since other celestial bodies in the outer Solar System, like Europa, Titan, and even Pluto, might have ice volcanoes, too. 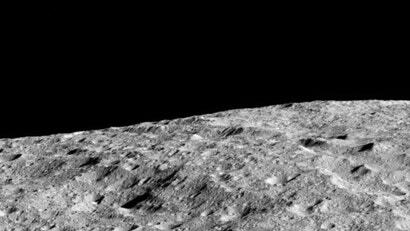 The researchers behind the new study looked through images taken by Dawn’s Framing Camera and searched for dome-shaped features larger than 10 kilometers in diameter, a signature of cryovolcanic activity. They were able to take reliable measurements of 22, and even found one the same size, though wider and shorter, as Ahuna Mons. Their computer modelling, based on past data, demonstrated that these domes were around 50 per cent ice by volume.